?Do I need to report my reckless driving conviction on a job application? ?Am I pleading guilty if I sign a reckless driving ticket? ?What Do The Points On My Driving Record Mean? A person can get a traffic ticket for a variety of different reasons, and the severity of the ticket will depend on why the person was stopped. For example, eluding the police in your car is a traffic ticket in the most basic sense, but it can be a felony or a misdemeanor. These are serious charges and cannot be prepaid because they often carry the potential for active or suspended jail time, and potentially other consequences. On the other hand, simple speeding charges (anything under 80 mph and less than 20 miles over the speed limit), disregarding a traffic light or highway sign, and many similar traffic offenses are considered infractions, which may be paid without ever entering the courthouse. But should you always prepay your tickets? That is unfortunately not always a simple decision. What is the Driver’s License Demerit Point System? Virginia driver’s license holders are subject to the demerit point system created by the Virginia Department of Motor Vehicles (VDMV). The VDMV overview of the demerit point system and how it works can be found here, and there are links to additional details on the DMV website from there. Most traffic infractions carry three to four demerit points, and serious offenses like reckless driving, DWI, eluding, and other offenses carry six demerit points. Prepaying your ticket can become complicated in a couple different situations. The first is when you have recently been convicted of other moving violations (whether serious or not). The Virginia DMV will send a driver an advisory letter informing them of the potential risks they face if they have accumulated 8 demerit points in 12 months, or 12 demerit points in 24 months. 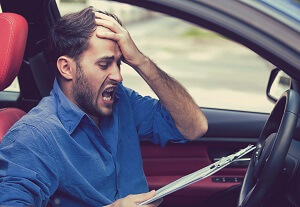 If that warning is not heeded and the driver accumulates 12 demerit points within 12 months or 18 demerit points within 24 months, they will receive notice from the Virginia DMV telling them that they must complete an online or in-person driver improvement course. However, drivers who are 18 or 19 years old may not use the online option. Things get worse for the driver if they accumulate 18 demerit points in 12 months or 24 demerit points in 24 months. If either of those conditions occur, the driver will have their license automatically suspended by Virginia DMV for 90 days, will have to complete another driver improvement clinic, and will be placed on DMV probation. All of this would be in addition to anything ordered by a judge as part of the punishment for the conviction. Can I Prepay a Ticket if I’m on Probation or Bond? The second situation where prepaying a traffic infraction can be complicated is if the driver is on probation or bond. If a person is on supervised probation, they must report the infraction to their probation officer. Depending on the probation officer and the reason for driver’s probation, even a minor moving violation may lead to a probation violation, which is a separate criminal offense and can lead to a number of additional negative consequences for the driver beyond the moving violation itself. Likewise, a person placed on bond with pre-trial supervision will be in the same situation as the person above. The main difference between probation and bond, however, is the consequence that will befall the driver. In the bond context, the individual will have to appear in front of a judge to explain why their bond should not be revoked in light of the traffic infraction. Again, depending on the circumstances of the original case for which bond was granted, and the severity of the new traffic charge, the driver may be placed in jail until trial. Before you prepay that ticket, call an attorney at Greenspun Shapiro PC at 703-352-0100 to make sure you do not inadvertently create additional negative consequences for yourself, and to learn what you could possibly do to prevail.